Cut at The Town House, stamper/metalwork by Gedmal Galvanic Ltd.
A dour goodbye, Vince Clarke was moving away from warm fat analogues to tinny digital Casio synths at this time, says it all. This album is great! It also has samples of the producer (?) saying "I think you should do the first one again Vince" followed by looping laughter on the runout groove after the track "Good Times"
Perfect, listen to this. Electro/Blue. "You And Me Both" is a striking collection of "goodbyes" and even if we didn't know about the tempestuous relationship between the two at the time, it would still alarm there are no happy endings here (starting with somewhat violent cover art, displaying two dogs at conflict) - "Nobody's Diary" evidently marks this; the album merely starts and off kicks a soundtrack to one-foot-in-the-door situation. "Softly Over" also strikes immediately, insisting "it's over, there's nothing more to say" and the further the grooves take you, away's cloud of sadness and melancholy pounds mercilessly. Even "Happy People" (amazing synth-pop hit-classic that never was) adds insult to injury - the title offers a moment of relief among the songs of despair and loss, only with a sense of irony. While their previous record - "Upstairs At Eric's" - undoubtedly remains a bigger darling of the two, "You And Me Both", while lacking eclecticism, is more mature. From it's repertoire, despite the fact "Nobody's Diary" is a well-deserved hit, Yazoo intended to conclude their chapter, choosing not to go quietly and make it in discreet fashion - "Mr. Blue", "Ode To Boy", "Anyone", "And On" are all beautiful examples of this, adding noir-flavour into the mix. Moyet's vocals rage with expressive beauty of a blues singer, at odds with Clarke's synthetic arrangements - some of which undermine the whole due clinically sterile and somewhat dated sounds, even for the year 1983; while in terms of idea, "Sweet Thing", for example, should have been a deserved new "Don't Go" kind of hit, clumsy tour-de-force beat box and horrible synth-horns kill off the pleasure of listening. The same thing happens to "Good Times" - an otherwise amazing song if only crafted with little more patience from what is delivered on the table; this way it sounds so desperate to be funky as hell, while on the other way out comes a shallow experiment. Among the album's other precious jewels is also a nice little groovy melancholy called "Walk Away From Love" and especially "Unmarked" - a striking synth-pop tune augmented by military snare drum programs to great effect. 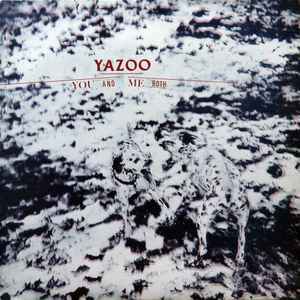 The story goes, Yazoo already split when "You And Me Both" hit the shelves. From the distance of almost thirty years now, it should be regarded as a masterpiece in its own right, despite some of its obvious drawbacks. Also worth noticing is some tiny distinction in the gorgeous cover art by 23 Envelope - while most editions of the album feature identical bold lettering for "Yazoo" on the front cover, there happens to be some (UK? original?) edition which features somewhat thinner lettering (called "Albertus"). Flashes of brilliance in too few songs, most-notably the opening track, "Nobody's Diary." While other songs may contain good structure or well-crafted sounds, none have its consistency and combination of these elements. Success seems to have gone to Moyet's head, who perhaps more boldly lent herself songwriting duties. Too many tracks lent me to this suspicion, and upon researching discovered that she wrote on 7/11 tracks on You And Me Both versus 5/11 on the duo's previous offering. Clarke seems unable to adapt to Moyet's style with inspiration leading to the demise of many tracks and ultimately the band itself.